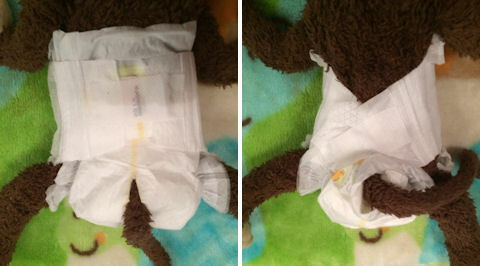 Amongst primate owners, the most commonly known method of diapering is the tail hole method but more and more primate owners are switching over to the tail wrap method. Since I’ve used both methods myself and don’t really have a particular preference, I reached out to other primate owners to find out why they prefer one method over the other. Before we go into more details, I’ve recorded a short video to demonstrate the difference between both methods. After that we’ll talk about diaper covers, different diaper brands, and what monkey parents are doing to prevent diaper rash. During recent years, the feeding of PRIMATES has undergone significant changes, as more has been discovered about their nutritional needs. The pets market of today provide different “monkey pellets” , pelleted diets they are usually well balanced but they can not by given at the expense of a varied diet. It is no coincidence that when breeding began in earnest during the 1950s, it was the OLD WORLD species which reproduced most successfully in collections. This is because MONKEYS such as the MACACA species were best-suited to thrive and breed on a diet composed of little more than vegetables and fruits. Marmosets and Squirrel Monkeys don’t mix! It is known among big breeders and it’s time that you know it too. Marmosets, Tamarins or Owl monkeys cannot be put together with squirrel monkeys. Squirrel monkeys are the carrier of the herpes saimiri virus, which is deadly for marmosets, tamarins and owl monkeys. Once they are infected, death can occur within 24 hours. A squirrel monkey who carries herpes saimiri, doesn’t show any symptoms and unfortunately testing for this virus are not conclusive. A big breeder told me once that he lost a whole colony of marmosets within a few days caused by this virus although his squirrels and marmosets were housed far from each other. The problem is that you cannot see the virus. It can be spread by handling the food, dishes or toys touched by a squirrel monkey. Just walking from one cage to the other can cause the infection already. » Read more: Marmosets and Squirrel Monkeys don’t mix! When we first go into Sammy’s room, she stands with her back to me and holds onto the door to her cage while I take her belt and diaper off. You are currently browsing the archives for the owl monkeys category.